Think of the worst movie you’ve ever seen – a movie that didn’t make you laugh, didn’t make you cry, didn’t move you or change you in any way besides giving you the desperate urge to flee the theater. Think of a movie that was a massive waste of your time and money. Hold that title in your mind. “Paul Blart: Mall Cop 2” is worse than that. This may sound like hyperbole or piling on. As of this writing, “Paul Blart: Mall Cop 2” is at zero percent on Rotten Tomatoes. (Mind you, Sony didn’t screen it for critics before opening day, which is never a show of confidence, so the reviews are still trickling in.) But truly, there is not a single redeeming moment in director Andy Fickman’s film. A general flatness and lethargy permeates these reheated proceedings. The jokes never land. The slapstick seems strained. The characters are one-dimensional. And the vague attempts at heart at the end don’t feel earned. 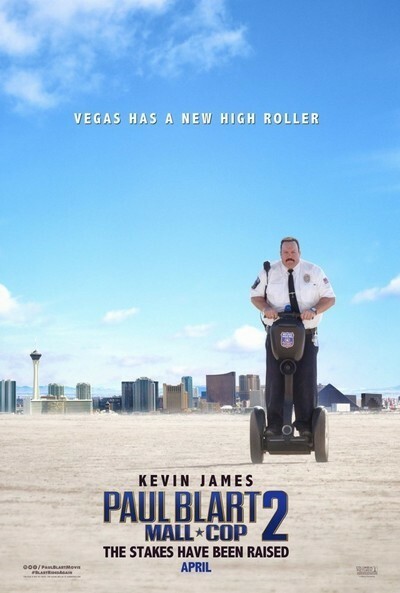 This is essentially the same movie as the inexplicably successful original “Paul Blart: Mall Cop,” which made over $183 million worldwide in 2009. Only this time, Kevin James is even more unlikable as the title character. It seemed impossible when the first film came out that this endearing everyman could play a character that stripped him of all his best on-screen qualities. Back then, Paul Blart was just needy, clueless and annoying, as he smugly patrolled a New Jersey mall on his Segway. In the sequel, he’s all of those things but he’s also bitter, rude and condescending, which makes him even more repulsive. All Paul has left is his darling teenage daughter, Maya (Raini Rodriguez), of whom he’s more psychotically overprotective than ever. So naturally, she can’t tell her dad the good news that she got into UCLA. She has to withhold that information to provide the film with a forced source of tension. Maya also has to come with Paul to Las Vegas, where he’s an uninspired cliché of the tacky tourist with his loud shirts, tight shorts and cheap ways. But he carries himself with the swagger of a high roller when he gets the wrongheaded notion that he’s the convention’s keynote speaker. This includes talking down to the hotel’s beautiful and polished general manager (Daniella Alonso), which makes her fall in love with him, naturally. Just as baffling is the quasi-romantic connection that occurs between Maya and one of the hotel’s valet parking attendants (David Henrie), who seems to have all day to hang around with her, take her for drinks poolside and invite her to a party in a swanky suite. Now I’m just nitpicking. There are much bigger problems here. The central premise of “Paul Blart: Mall Cop 2” is that Paul inadvertently thwarts a major heist of Wynn’s famous art collection. The mastermind is the cool and crisply dressed Vincent (Neal McDonough, playing a generic bad guy, again), who has infiltrated the hotel’s own security staff to pull off the crime. Paul throws himself into the action, literally, which results in a series of lame goofs, pratfalls and sight gags. These include a fight with an angry peacock (whom he totally provokes, by the way) and an overlong appearance in the Cirque du Soleil show “Le Reve.” In the process, he also must save Maya, who somehow managed to discover the scheme within the vast square footage of the Wynn hotel and fell into the villains’ hands. For some reason, James likes this character, which must mean that he has zero recognition of his strengths as an actor at this point. He also co-wrote the script again with his longtime writing partner, Nick Bakay. Hopefully, they’ll both realize that Paul Blart has collided face-first with every object imaginable by now, and we can all call it a day.